Michael M., Michael S. and Summer do a quick phone check before jumping into a world-building email that Mike S. received, asking for help. His suggestions on what to do in that situation can be found in a back issue of "The Secrets", Issue 68. This leads into a chat about building your worlds and characters, and what works for different people that might work for you. We also discuss what happens when the characters in your head start acting on their own impulses rather than your initial intentions for them. 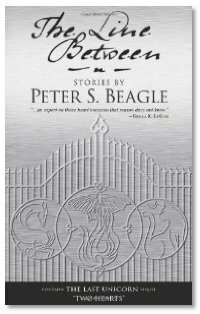 Interview: This week, we talk to Peter S. Beagle and Connor Cochran about his writing work and his writing process, as well as Connor's dedicated work in pursuing monies still owed Peter from old contracts not being honored by film companies, and Connor's work in getting many of Peter's wonderful but previously unpublished stories. Many of these new novellas and short stories are coming out in anthologies and individual publications all over. Peter won a Hugo Award for "Two Hearts" in 2006, and has also been nominated for a Nebula Award (to be awarded in NYC in May 2007). The Library: Michael M reminisces about how many older books he had to clear out last year before delving into The Library: "The Myth Hunters", by Christopher Golden, "Blood Bound" by Patricia Briggs, "Night Rising" by Chris Marie Green, "The Eagle" by Jack Whyte, "Faerie Wars" by Herbie Brennan, "Capacity" by Tony Ballantyne, and "The Assassin King" by Elizabeth Haydon are this week's new titles. Hi y'all. I was directed here by a friend, Andy, and have to say that not only is it totally cool that y'all are from Arizona, my own neck of the woods, but that you are also so involved with local writing celebrities. I loved the podcaste but wanted to point one thing out about something you said, when talking about asking silly questions of your characters, for example, "What's your favorite color" so as to open new ways to know the character. I'd like to say though, from my own experience as a writer, that for me, asking the stupid questions becomes a stall tactic. I ask those questions because they're easy to ask. I end up asking them instead of the one question that not only scares me as a writer, but scares the character. And yet, when I do ask that one heavy hitting question, thats when both the character and I learn something new, and I've found that those things are the ones that change the story and make it worth reading. I'm so glad I listened to this caste. I think y'all got a new fan here and I look forward to future podcastes from you. Great show. Love the guests and the writing discussion. Cover to Cover is evolving to about writing and you are considering expanding outside of scifi and fantasy. I suggest you add some scifi and fantasy books into Slice of Scifi. The writing stuff seems to be pusing out book reviews. John, we haven't had formal book reviews inside the "Cover to Cover" shows in at least 6 months, probably closer to 8 months, and we're still talking to authors about their newest books. We have two new book reviewers who've posted 6 new book reviews to the website in the past month or so, and the Library segment is as lively as ever and not going anywhere... in fact, that might expand a little, too. Matter of fact, Brian and Tim may start adding audio versions of the reviews they're doing, either in the shows, or as a separate self-contained segment, but we're still working out the logistics on that part of it. Trust me, Cover to Cover is not going to be 100% about writing. You might also want to check out the three hour, forty-six minute interview that Peter S. Beagle and Connor Cochran gave me, on The Biblio File. I wonder if we should have an extended cut version of our shows, for the fans who like the longer shows. There are some people you just need to talk to for more than 20 minutes. Summer - absolutely, please feel free to run longer versions! Thank you so much for this world-building/character discussion!!!! It's been a while since I've heard/read these facts, and I've written a novel since. I blogged about the process about two weeks ago when I finished. I had an ending and a second book planned based on this story's conclusion, and then my protagonist "figured out a way to neutralize Big Bad's threat because he saw the conflict much differently than I did...And so effective was the squash, the Big Bad doesn't even have reason anymore to cause the major warfare that I would be attempting to cover in Book Two (quote from my log)"
And actually, now that I look back, I'm glad the protagonist did what he did, because I dreaded the idea of writing a whole novel about a big war. Tolkien did it already, and then Donalson did it in the first Covenant series.